Teddy has always been an active dog. He loves running outside and chasing after squirrels. One day, Teddy chased a little too hard and started to limp on his right back leg. When his owner brought him to the vet for an evaluation, it turned out that Teddy had torn his ACL in his right knee. It was at that point that Teddy’s owner was given the option to repair Teddy’s knee through an ACL repair surgery called a lateral suture (where the knee with the torn ACL is stabilized with a strong filament). Teddy’s lateral suture was a huge success, but he had severe muscle loss and inflammation in his right leg following the surgery. Teddy came in for a consult for post surgery physical therapy. During this consult we obtained a variety of information about muscle mass, degree of lameness, range of motion and trigger points. One thing that is extremely cool that we were able to do was to get a thermal image of Teddy’s surgical leg right after the surgery, and then after he completed 10 sessions of rehab over 5 weeks. 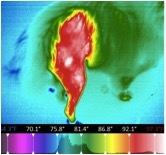 Thermal Image 1 (before rehab): Areas of white show the highest level of inflammation. The photo above was taken after surgery and before rehab. 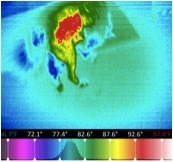 Thermal Image 2: Teddy after completing 10 sessions of rehab. Note the white inflammatory areas are now gone. Following 10 sessions of rehab, Teddy had full return to function and was back to running and playing again. Not only did he regain function in his surgical leg, but he was much more comfortable after rehabilitation as shown by the thermal images above where areas of inflammation (shown in red and white) were greatly reduced to more of a “neutral” temperature reading (green and yellow) after 10 sessions of rehab. This entry was posted in Treatment. Bookmark the permalink. Copyright © 2019 Pet Dominion.